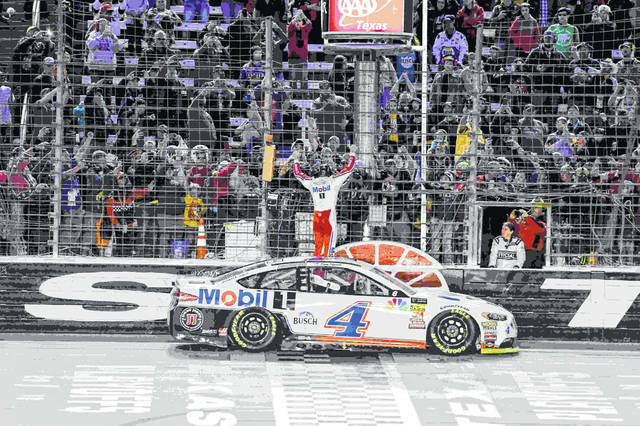 FORT WORTH, Texas (AP) — Kevin Harvick earned a shot at another NASCAR Cup championship, rocketing past polesitter Ryan Blaney in overtime Sunday to win at Texas. After taking the inside on the first two restarts, and briefly losing the lead after the second one, Harvick opted to start from outside for the green-white-checkered finish. By time they got to the backstretch, Harvick had pushed his No. 4 Ford in front and raced to his eighth win of this season. It is the second year in a row that Harvick, the 2014 Cup champion, won the fall race at Texas to get into the final four. Of his 32 starts in the Lone Star State, his only two wins are the last two fall races, but those are among his 20 top-10 finishes there. “This place has been really good to me. I’m glad we got the win again here,” he said. Harvick was on the inside again for the next restart, before Blaney was able to get by him on the outside and into the lead. Blaney led seven laps before Harvick went under him and was again putting distance between them before Joey Gase’s spin brought out the last of eight cautions. Truex, who was close to clinching a title spot before that bump-and-run by Logano on the final lap to win at Martinsville last week, finished ninth after at Texas. Truex had to start at the rear of the field because of an engine change. He also had a pass-through penalty during the race for driving through too many pit boxes, and was a lap down before getting that back one the first of the late cautions. Logano was third at Texas. Elliott was sixth, followed by Kurt Busch and Almirola, who had also gone to the rear at the start of the race for unapproved body modifications. Kyle Busch was 17th and Bowyer 26th after starting on the front row but making contact with Denny Hamlin on the first lap.